Dr. Tiffany Brienza was born and raised in Brooklyn, New York. She attended college at Stony Brook University where she received her B.A in Psychology. After graduation, Dr. Brienza ventured to the beautiful island of Grenada to attend St. George’s University, West Indies for veterinary school and went on to complete her clinical training at North Carolina State University. Dr. Brienza spent the last two and a half years practicing at North Shore Animal League Of America, one of the worlds largest no kill animal and rescue adoption organizations. After experiencing the many different areas of veterinary medicine, she found her passion in the diversity of general practice and thoroughly enjoys being part of a team she can call a family. Areas of professional interest include internal medicine, neurology, low stress care and feline medicine. During her spare time, she enjoys the great outdoors and moved to Florida for the endless sunshine. She frequents the beach, hiking, camping and spending quality time with her friends, family and one-eyed cat named Phoenix. Meow! I’m Emily and I REALLY love cats. I love every kind of cat and I just want to hug all of them. I love their little ears, their whiskers, and their nose! I love them in a basket with little bow ties, and I love them on a rainbow with unicorns and sparkles! Hi, I’m Andres and I’ve been in the Veterinary field since I was 16 years old. I love caring for pets and nursing them back to health. My passion for pets has led me to pursue roles in emergency and surgical care, and now into hospital management. I share my life with two American Bulldogs: Petey and Mr. Bentley. In my free time I enjoy playing hockey, rollerblading with my dogs and enjoying the Florida outdoors. Hi! My name is Dezirae. I’m a South Florida native with a huge passion for all things furry, including wildlife! I am currently a student at FAU working on my Bachelors degree. I have a slight obsession with reptiles, and have also been known to melt over the puppies and kittens that walk through our door. Hey there! My name is Gigi, I was born and raised in Italy surrounded by furry creatures in the countryside. I’ve always loved animals and truly appreciate the joy and love they bring to our families. I am currently working on my bachelors degree in biology and hope to one day become a veterinarian. I share my home with 6 meowers, 3 barkers and one 2-legged companion. As you can see, I am extremely in love with animals. I could not see my life without surrounding myself with as many furry creatures as possible. My animals are part of my family and I know that you feel the same way too. Hi, I’m Ashlyn and working with animals has always been a huge part of my life. Before working in veterinary medicine, I used to be a dog trainer. I still love teaching puppy training and obedience and I am happy to give you and your cute puppies any tips you might need. I have also worked as a head Zookeeper and been lucky enough to have raised lion & tiger cubs! I’ve been in the Veterinary field for over six years and I love it. My favorite part is getting to know my patients and bonding with our clients! I’m a proud dog mama to three big pups – two shepherd mixes and a pit bull mix – that are my world! I affectionately refer to them as my wolf pack and we all love hiking in the mountains whenever we get the chance. I go above and beyond for my own animals, and I will always do the same for yours! Hi! I’m Emily, I was born and raised in south Florida and have been grooming since I was 20 years old. I love what I do SO much, my passion for animals is what drove me to learn how to style and care for them. I have two amazing puppers of my own, a handsome good boy husky named Onix and my little crazy pants mixed puppy named Ramona. I’m here to help your pet look their best, so they can feel their best! I have been safety certified to give you as a pet parent the peace of mind of knowing your fur babies are in good hands. Come on in and book an appointment with me! I can’t wait to meet you, and give your pet the spa day they deserve! 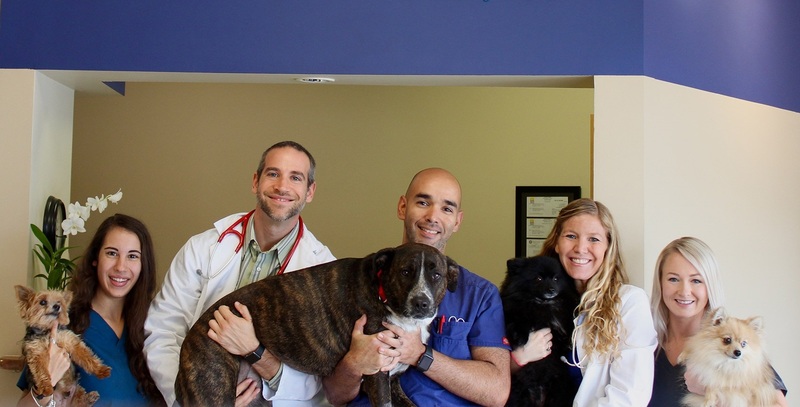 Dr. Mazzaschi and Dr. Katz established Healthy Pets Veterinary Care with the fundamental goal not only to care for animals, but also the people the love them. Dr. Mazzaschi shares her home with Dr. Katz, an Old English Sheepdog named Max and two handsome cats, Brady and Randy. In her free time, Dr. Mazzaschi and Max volunteer at local libraries helping young children learn to read through the R.E.A.D Program (Reading Education Assistance Dogs). She spends the rest of her free time gardening, sewing and traveling. Meow! I'm Emily and I REALLY love cats. I love every kind of cat and I just want to hug all of them. I love their little ears, their whiskers, and their nose! I love them in a basket with little bow ties, and I love them on a rainbow with unicorns and sparkles! Hi! My name is Dezirae. I'm a South Florida native with a huge passion for all things furry, including wildlife! I am currently a student at FAU working on my Bachelors degree. I have a slight obsession with reptiles, and have also been known to melt over the puppies and kittens that walk through our door. Hi, I’m Ashlyn and working with animals has always been a huge part of my life. Before working in veterinary medicine, I used to be a dog trainer. I still love teaching puppy training and obedience and I am happy to give you and your cute puppies any tips you might need. I have also worked as a head Zookeeper and been lucky enough to have raised lion & tiger cubs! I've been in the Veterinary field for over six years and I love it. My favorite part is getting to know my patients and bonding with our clients!I'm a proud dog mama to three big pups - two shepherd mixes and a pit bull mix - that are my world! I affectionately refer to them as my wolf pack and we all love hiking in the mountains whenever we get the chance. I go above and beyond for my own animals, and I will always do the same for yours!